As we reach the final weeks of winter, there’s still plenty of two-wheel fun to be had. Find out what biker events are happening near you this February. We’ve got it covered from indoor exhibitions to charity ride outs, whatever takes your fancy. Discover more now…. It’s time again for Northern Ireland’s biggest motorcycle show! With three days of jam-packed biking fun, NI MotorcycleFest is promising a whole host of entertainment including some of the leading manufacturers; Kawasaki, Triumph and BMW. Looking for some new gears? Take a visit to the autojumble and you’ll be sure to find what you’re looking for. Devitt are heading back to the ExCel in London for the MCN Motorcycle Show this year. Features of this year’s show include Custom & Classic Zones, plenty of action in the Live Thunderdrome and lots of new bikes on display. Don’t forget to pop by McGunniess’ bar for a pint and a chat with the legend himself. Fancy getting up close and personal with all the action? Book yourself a paddock pass and you’ll be rubbing shoulders with the likes of Foggy, Chris Walker, Neil Hodgson and Ruben Xaus. Tickets start from £40 (including show entry). Steve Colley will be back with his amazing stunt show ready to impress you all. Tickets start from £15. Check out our highlights from last year’s show! 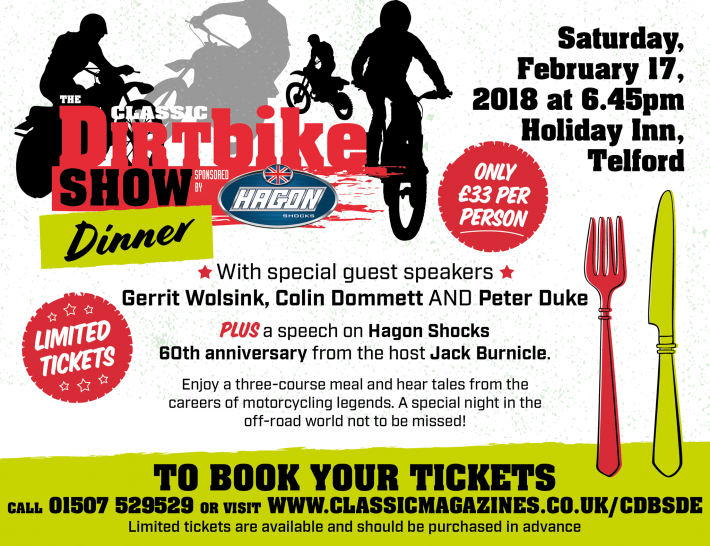 Sponsored by Hagon Shocks, Telford’s annual classic dirt bike show is back again for 2018. You’re promised a weekend full of off-road and road racing amusement with some big names making an appearance. Guest of honour for the weekend include former Dutch professional Grand Prix motocross racer, Gerrit Wolsink. Colin Dommett, who’s done it all from solo trials to classic scrambling and sidecar trials. Peter Duke, son of late world champion Geoff Duke and Roger Garrett, top 35 Maico rider, will also be making an appearance. Don’t forget the traditional dinner event on the Saturday evening; this includes a three-course sit down meal with racing legends discussing their legacies. Tickets for this event cost just £33. Find out more information about the Classic Dirt Bike Show here. Make sure you pick up your free copy of the trade newspaper at the gate on your way in so you can find out exactly what’s happening in the autojumble world. Don’t forget if you’re an early bird then you can get admission before 8am for £10, but standard admission starts from 10am at just £7. Children and dogs go free. What biker events are you attending this month? Leave them in the comments below and we’ll add them to our guide!